Owning a humidifier may be one of the smartest things one can do as they make your home more comfortable, easier to breathe, and in general raise your health and happiness levels. But regular cleaning comes with the territory too. Cleaning humidifiers is just as important to your daily health as owning one in the first place. So if you do own one, it is important to learn how to clean humidifiers. Your humidifier is supposed to keep you healthy, providing steady air quality and moist air in the winter months. But neglect to clean your humidifier, and it could do more harm than good. You certainly do not want to be breathing in bacteria and mold spewed by your humidifier nor do you want to help foster the very issues you were trying to eradicate. 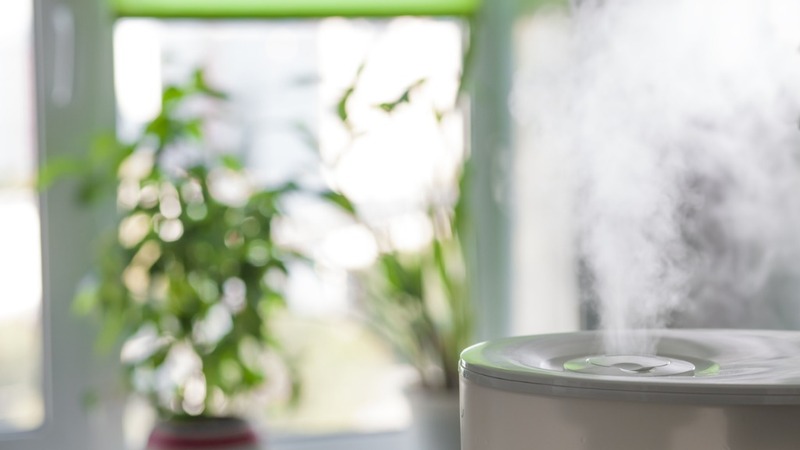 Poor humidifier use could lead to asthma attacks, lung inflammation, and coughing fits. The bottom line is that a humidifier left uncleaned fails to work properly. So keep it clean. Giving your humidifier a deep clean every once in a while to ensure that your unit is working properly. You’ll need a few household items and a bit of time, but other than that learning how to clean humidifiers is not too much work. 1) Gather your materials. You’ll need to find a few items around the house or at the supermarket: white vinegar, bleach (or hydrogen peroxide), soft brush, water, towels or clothes, and gloves. 2) Disassemble as much you can. Unplug your humidifier from the wall and take apart all the pieces. Take apart the water tank, air filter, and any other removable parts that comes with your humidifier model. Empty the water from the tank and clean the air filter by running water through it and drying. 3) Soak in vinegar. Pour white vinegar into the base and any other area of your humidifier that comes into regular contact with water. Smaller pieces can be soaked entirely in a suitable container of white vinegar. Let it all sit for at least 30 minutes to allow the vinegar to work on breaking down the residue. 4) Scrub. The most persistent residue can be dislodged using a soft-bristled brush or something similar. Reach into the tough-to-reach spots on the humidifier and make sure that they get cleaned. 5) Add bleach. Mix together one teaspoon of bleach for every gallon of water and fill the humidifier tank with this mixture at least until it is halfway full. Swish the liquid around the humidifier to make sure that it has cleaned every nook and cranny. If you don’t have bleach at your disposal, you can substitute it with a 3% hydrogen peroxide liquid. Put on your gloves for this step because you always want to be cautious when handling bleach and other chemicals. 6) Rinse thoroughly. Rinse through the humidifier thoroughly to remove the bleach and vinegar. You may have to do this a couple times before the cleaning products are all rinsed out. Just make sure there are no foul smells emanating from your humidifier as you don’t want it to affect your humidifiers performance. Dry all the parts on towels or cloths. 7) Reassemble and Use. Once everything is dry your humidifier is good to go. Resume using it and breathe in the fresh air it provides. Remember to replace your humidifiers air filter when you are supposed to and try to fill the tank with mineral-free water to prevent residue buildup. Make a schedule for cleaning humidifiers about once a week and if you decide to store your unit, definitely clean it first. You know all there is to know about how to clean humidifiers now! It’s of vital importance to keep your humidifier clean and that means regular, weekly care. Revel in the clean moist air that your humidifier provides and thanks for reading!